A series of coincidences--someone cancelled their show at the last minute, someone was hanging around, someone suggested something and someone encouraged it--led to the impromptu exhibition of five of Petra Sairanen's glowing and dappled works on canvas at the WeatherVane Gallery & Club. The bar, performance and exhibition space on Elliot St. is one of the newest and most exciting venues in the Brattleboro downtown art scene. On a recent Sunday evening, a small and polite crowd listened to a performance by Ameranouche Gypsy Jazz, who were talented, clean and eclectic. On the spotlit walls, Sairanen's layered creations throbbed like portholes into another dimension. The casual social space at the WeatherVane provided a congenial atmosphere for contemplating their otherworldly content. Petra Sairanen studied painting at the University of New Hampshire, which awarded her a B.F.A. in 1995. She spent time studying at Brandeis University and finally received her M.F.A. in painting from Boston University in 2003. She has received numerous awards for her work (too many to list here!) and has exhibited extensively throughout New England since 1996, with 12 shows in 2003-04 alone. She has plenty to show. The five oil paintings at the WeatherVane ranged greatly in scale. The smallest, sort of behind the bar, was about two feet by two feet, while the largest, looming on the left as you enter, around six by nine, horizontal. Quite enormous, actually. In the bar, you could see the large one from up close in the booth or from a distance on the dance floor. The two effects were very different. In a concise statement posted on the wall, the artist says that her work "evolved out of landscape and is largely influenced by my responses to nature's everpresent patterns of light and movement." Traditional landscape space per se (planes, objects or values receding to a horizon or beyond) has been struck, while a shallower, more two-dimensional space hovers on a surface or dissolves behind curtains of transparant oil glazes. Her glazing technique looks consistent yet casual, meditative yet obsessive. One can't help but wonder, since Sairanen, like a Navajo or Hopi sand painter, works on these prestretched canvases "on the floor," how she does this on such a large surface. But the end result is obvious, in that the paintings become strong in their character as objects. Their three-dimensionality as stretched canvases is emphasized by the drips on the stretcher edges, which show the colors of glazes painted over and lost on the surface. Also, their extremely "touched" feeling, the tactile surface quality coming from the oil glazes applied with Chinese calligraphy brushes. One imagines the painter moving around the painting, bending over it, reaching across it, moving it. The "objectness" implied by an intense surface and emphasized edges means that one looks at the paintings quite a bit before being drawn to look into them. But looking into them is when the fun starts. Petra's style of painting, abstract though it be, is extremely accessible to the viewer, perhaps because of the combination of a rich surface and an inherently familiar iconography. 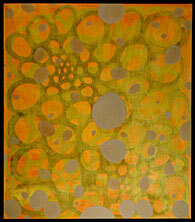 Each of the paintings is composed of circles. Titles are in Finnish--Sairanen grew up in Finland. "Sysimusta" is a vertical composition, oil on canvas, about 54" x 32". The process of painting seems clear. 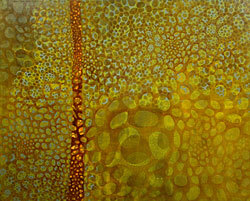 Layers of thin, transparent glazes are painted over each other. The earliest applied glazes, in this case ochres, olives and khakis, are light or medium values and create atmospheric depth, or the background. Each layer is a network of connected circles which leave the negative space of that circle open, like a window to the layers below. 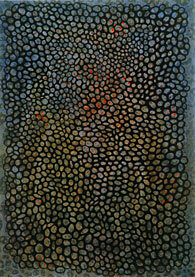 In "Sysimusta" a layer of thinly sown red dots is visible in the mix. While still fresh, the painting is resolved by a final layer, darker in value, which becomes the surface layer. It is important to know that each color is not preplanned but is an immediate reaction to the colors already laid down. 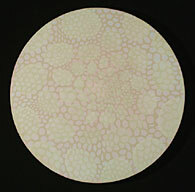 "Sysimusta" (Pitchdark) is resolved with a black glaze describing a large body of rubbing and crowded single-cell circle shapes. Piled or amassed, they create a large shape or entity which reaches towards the edges of the painting, not quite filling the rectangle but, instead, hovering in place. Within the mass of round, connected amorphae, clusters of the small balloons seem to create larger shapes and gestures, which might signify objects or ideas--it's hard to say. The repeated circles, however, bring multiple images to mind. Bunches of floating bubbles or the patterned skin of reptiles, to name a couple. Overheard at one table was "looking down on the heads of a crowd," and after a measured stare, one plaid-shirted mugholder said, "Looks like the end of a pile o' stacked chunkwood, but really beautiful." 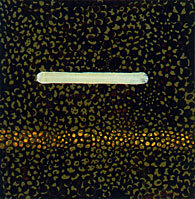 The painting glows with an inner ochre light, spiced up by the red and bright orange dots that are patterned through the "interior" but retain an element of surprise in their placement. A small painting behind the bar was entitled "Yo"; it was about two feet square. Peering into its innards revealed a rusty-red ground covered with small texturous black marks and a yellow slash cutting completely across the canvas, about one third up from the bottom, reaching from end to end. These visual elements are barely visible beneath the overglazed layers of tan and dark sepia which fill the entire canvas with an organic pattern of linked circles. Another layer of large black dots are hard to discern (is that the donut hole or the hole in the donut?). The otherwise consistent layers of patterned circles filling this composition are broken and contrasted by a single milky-white horizontal brush stroke of paint that floats on the surface a little above the center. This "naked" brushstroke is not only gestural and expressive but spontaneous and carefully considered at the same time. It references, of course, that underlying horizontal slash previously mentioned. In a large painting entitled "Sininen Hetki," deep and glowing aquatic blues are explored beginning with an underglaze of dark ultramarine (though, by looking at the edge of the stretcher, it is possible to see that there is a cadmium red under all). 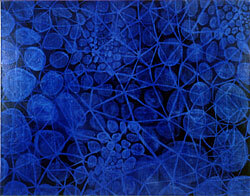 Over the deeper blue are large silvery and slightly cerulean-blue egg shapes which become smaller and more clustered near the top center of the painting. The smaller shapes resist moving back in space by being brighter, more silvery and reflective, so that consistent spatial planes are retained. Over this is a web of geometric lines that connect in many large, scattered triangles. This painting seems like earlier thought than the other four in the show, which share a fairly concise style. However, the light geometric layer over the round and amorphous underlayers seems to identify consistent thought which has been simplified down to that milky-white gestural brushstroke in "Yo." Petra Sairanen is fairly new to the arts community in Brattleboro, but she brings a refreshingly contemporary approach to oil painting and will hopefully show us more of her work. She has a show in Portsmouth, New Hampshire now also, so we don't know what we're missing there. She is teaching printmaking at Putney School, and, in fact much of her current painting style is influenced by her past printmaking. Her patterned, calligraphic and transparently layered compositions glow, breathe and expand for the viewer in ways which cannot be described and must be seen. As for the WeatherVane, the location, already well known for its musical events and atmosphere, has really stepped out with a very good show of paintings and should be on your First Friday rounds. We'll just have to say that, as the weather evolves through the Winter months, we should probably keep one eye on the WeatherVane. Petra will be having an Open Studio sale at her Cotton Mill Hill space on Saturday, December 11, 10 to 6. For more information, call her at 802-254-8141.